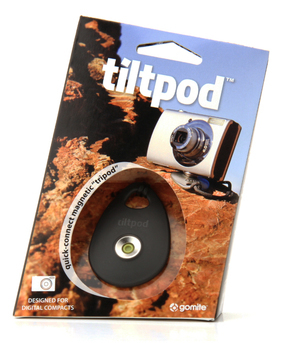 The world's smallest quick-connect magnetic pocket "tripod"
The tiltpod is the first truly pocketable camera support. No more digging through your bag for a tripod, and no more precarious balancing your expensive compact camera. 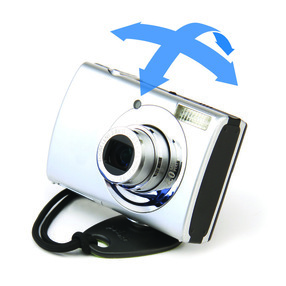 Just attach the tiltpod to your camera’s wrist strap and you are always ready to get the perfect shot. * Amazingly small and versatile, stays attached to the camera’s wrist strap (included). * Perfect for taking sharp low-light shots, self-timer group photos, and stable video. * Magnetic base can be quickly attached and removed from the camera. * Micro positioning pivot for maximum range of motion and precision control. * Works with most compact cameras and Flipcam video recorders. * Comes with a camera wrist strap, a magnetic tiltpod base, a screw mounted pivot, and an optional stick-on adhesive pivot for cameras with off-center tripod sockets. Note: Maximum recommended camera weight is 7 oz (200g). The tiltpod is not compatible with interchangeable lens cameras, like full-size DSLR’s, micro 4/3′s, or Sony NEX cameras. Snap it on, snap it off. 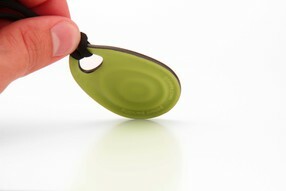 The tiltpod’s compact design features a quick-connect magnetic ball pivot. The rounded head screws into your camera’s tripod socket and magnetically connects to the base for an instant hold at just about any angle. Just tilt, point and shoot. The magnetic pivot allows you to quickly adjust the camera to get perfectly framed shots, even on uneven surfaces. * Nickel plated micro positioning pivot for maximum range of motion and precision control.